A brain tumor is one of the scariest diagnoses a patient can hear. Until the past 4 decades, with advent of advanced imaging (CT scanning, MRI), localization of brain tumors and other focal lesions was difficult. Old neuroimaging techniques consisted of skull radiography, which was usually negative, and pneumoencephalograms, which were invasive, painful, and often uninformative. Electroencephalograms (EEG) in man started in 1920s; in 1936, Walter, who introduced the term "delta waves," first identified the association between localized slow waves on EEG and tumors of the cerebral hemispheres. Delta is the frequency of EEG that is under 4 Hertz (Hz) whereas the normal alpha is between 8-12 Hz. This established EEG as an important tool for localizing brain tumors. For the next 4 decades, electroencephalographers mounted an enormous effort to improve accuracy of localization and to seek clues to underlying pathological processes. Experience has shown EEG to be somewhat reliable in localizing lesions involving superficial portions of the cerebral hemispheres, though it is of limited value in deep-seated lesions, especially posterior fossa tumors. The role of EEG in detecting focal cerebral disturbances has undergone a significant change since the development of CT scan and MRI. Today, EEG is primarily used to complement these studies by evaluating functional changes in the patient's condition, especially in regards to seizures and epilepsy; it demonstrates aspects of brain physiology that are not reflected in structural neuroimaging. Functional neuroimaging techniques, such as positron emission tomography (PET), single-photon emission computed tomography (SPECT), and functional MRI (fMRI), can exhibit physiologic changes but not with the temporal resolution of EEG. Furthermore, EEG provides the only continuous measure of cerebral function over time and is the diagnostic test of choice regarding seizures and epilepsy which is common with brain tumors. This article reviews the major EEG changes that occur with different brain tumors. For patient education resources, visit eMedicineHealth's Cancer Center. Also, see eMedicineHealth's patient education articles Brain Cancer and Electroencephalography (EEG). The existence of preoperative seizures markedly increases the risk of postoperative seizures. Some studies have found no correlation with degree of subtotal resection, extent of surgery, age at diagnosis, pathological grade, or serum level of anticonvulsant drug  , but most have found superior seizure control in patients with total resection  . In one study, half of postoperative seizures occurred more than one month after the surgery, and half were recurrent  , including most of those that occurred late. EEG abnormalities in brain tumors depend on the stage at which the patient presents for evaluation. EEG changes observed with tumors result mainly from disturbances in bordering brain parenchyma, since tumor tissue is electrically silent (with the possible exception of tumors containing neuronal elements, such as gangliogliomas). For this reason, EEG localization often is misleading, although lateralization is generally reliable. Activation procedures are usually of limited value in patients with tumors, although hyperventilation occasionally can accentuate focal slowing. Asymmetries of photic driving can be useful at times, although they also can be misleading. A normal EEG occurs only in about 5% of hemispheric tumors but in 25% in deeper tumors. Focal delta (EEG frequency < 4 Hz) activity is the classic electrographic sign of a local disturbance in cerebral function; however, if the lesion is small, it could be theta activity (4-8 Hz). A structural lesion is strongly suggested if the delta activity is continuously present; shows variability in waveform amplitude, duration, and morphology (polymorphic); and persists during changes in physiologic states, such as sleep or alerting procedures. When focal delta is found without a corresponding imaging abnormality, it is usually in the setting of acute seizures (especially postictally), nonhemorrhagic infarction, or trauma. Delta activity that fails to persist into sleep or attenuates significantly with arousal or eye opening is less indicative of structural pathology, as is rhythmic or sinusoidal delta. The latter usually occurs intermittently and is termed intermittent rhythmic delta activity (IRDA). It is usually bilateral and of high amplitude and is typically maximal occipitally (OIRDA) in children and frontally (FIRDA) in adults. Unlike PDA, IRDA increases in drowsiness and attenuates with arousal. IRDA often is observed without structural pathology, as in metabolic encephalopathies, but it also can occur with diencephalic or other deep lesions; in this situation, an amplitude asymmetry can be present, with higher amplitude ipsilateral to the lesion. As in other clinical settings, theta activity is indicative of less severe localized or diffuse dysfunction than delta activity and is observed more commonly with functional than structural disturbances. When unaccompanied by delta activity, theta is less likely to indicate a lesion that produces a focal neurological deficit or seizures. Since tumor tissue probably does not generate electrical activity detectable with conventional recording techniques, electrical silence is the best localizing sign of a cerebral tumor. However, it is a rare finding, occurring only when the tumor involves significant cortical areas with minimal subcortical disruption. Incomplete loss of activity, especially faster normal rhythms, is observed more commonly and is diagnostically helpful. Alpha rhythm is the posterior dominant rhythm with eyes closed that is reactive; in normal adults, it is greater than 8.5Hz. By the time the patient presents with focal or diffuse neurological symptoms and signs, disturbance of the alpha rhythm may be observed. Slowing of the alpha rhythm ipsilateral to a tumor is more common and significant than asymmetry of amplitude. However, disturbance of alpha rhythm depends on the site of the tumor. The more posterior the location, the more the alpha tends to be slowed, nonpersistent, or disturbed by admixed theta waves. Rarely, the alpha rhythm may also fail to block the eye opening on the side of the neoplasm (Bancaud phenomenon). Abnormalities of beta activity usually are limited to voltage asymmetries. To be considered unequivocally abnormal, a persistent amplitude difference of one third or greater (expressed as a fraction of the higher voltage) should be present. Diminished beta activity results either from cortical dysfunction, as in parenchymal tumors, or from an increase in resistance of the medium-separating cortex from scalp-recording electrodes, as in meningiomas or subdural collections. Focally increased beta activity usually is associated with a skull defect, called breach rhythm. Certain medications can cause increased presence or prominence of beta activity. Spikes, sharp waves, or spike-wave complexes occurring with consistent localization are observed sometimes early in the course of brain tumors. However, they are more common either as early findings of slowly growing neoplasms associated with seizures or later after focal slowing has developed. Patients with tumors may exhibit periodic lateralized epileptiform discharges (PLEDs) at times, particularly after a series of seizures. 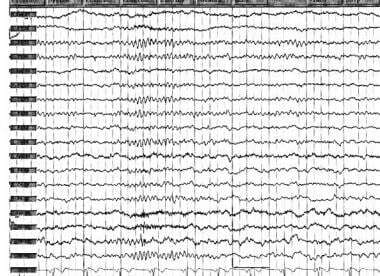 Most patients with this EEG finding have had or will have seizures, if they are observed sufficiently closely and persistently; the pattern likely represents a transitional state between ictal and interictal epileptiform discharges. Aggressiveness of treatment depends in part on whether the discharges are resolving (ie, becoming less sharp, more localized, and further apart) or the opposite. When prolonged electrographic seizures (>10 min) are recorded during a routine EEG, status epilepticus should be suspected. Clinical accompaniments may be subtle, as in aphasic or other forms of nonconvulsive status, particularly when the patient's baseline condition has been compromised by the tumor, its treatment, or complications. Since EEG reflects activity of cortical neurons, hemispheric tumors affect EEG most consistently and prominently. Slowing is Location is an important determinant of the likelihood and nature of EEG abnormalities. Frontal lobe tumors characteristically cause focal PDA, which accurately localizes the lesion. Especially if the lesion is close to the midline, PDA may be bilateral, but of higher amplitude and lower frequency ipsilateral to the tumor. In some cases, slowing may be IRDA rather than PDA. This occurs most often when deep structures such as the corpus callosum are involved (eg, butterfly glioma). The alpha rhythm (the posterior dominant rhythm) is often preserved. Temporal gliomas are generally the easiest to localize on EEG, since PDA occurs over the tumor site in more than 80% of patients. EEG from the contralateral hemisphere may be normal or may show much milder slowing. Since these tumors often are associated with seizures, they may demonstrate interictal epileptiform discharges. These discharges may be identical to those associated with nonneoplastic lesions such as mesial temporal sclerosis (which does not enhance, unlike most tumors), especially when the tumor is located medially, as is often the case with very slow-growing tumors, such as gangliogliomas and dysembryoplastic neuroepithelial tumors. Parietal tumors less often produce localized slowing; PDA usually is lateralized but often not clearly localized. When phase reversals are present, they may be temporal or frontal rather than parietal. In centroparietal tumors, mu rhythms (sensory motor cortical rhythm) may be attenuated ipsilaterally, but occasionally may be more persistent and of higher amplitude. Occipital gliomas often produce focal changes, especially PDA and alpha rhythm abnormalities. Occipital meningiomas, mainly of the tentorium, can cause more focal EEG changes. Deep hemispheric tumors include those than impinge on the lateral and third ventricles and surrounding structures, including the diencephalon, basal ganglia, and corpus callosum. Neuroimaging has led to earlier diagnosis of smaller tumors that may be associated with normal EEGs. In hypothalamic hamartomas, ictal and interictal EEG discharges may be seen over the frontal or temporal lobe, depending on whether anterior or posterior hypothalamus is involved. In the sellar region, the EEG is usually normal, although bitemporal slowing may be seen, especially with large lesions. In brainstem and cerebellar tumors, EEG is more often abnormal in children than in adults. If present, slowing is most often posterior and bilateral. IRDA may be observed, possibly more so if hydrocephalus is present. EEG is usually normal in cerebellopontine angle tumors. Slowing is often intermittent and usually but not always ipsilateral to the lesion; it may be bilateral or even predominantly contralateral. Cerebellar spikes and seizures can be seen. EEG patterns are not specific for tumor pathology, but some general correlations exist. Slowly growing extra-axial tumors, such as meningiomas, produce the mildest EEG disturbances, whereas rapidly growing intra-axial tumors, such as glioblastomas, cause the most marked abnormalities. Benign intra-axial tumors, such as astrocytomas or oligodendrogliomas, are intermediate in their effects on the EEG. Interictal discharges most commonly are observed initially in slowly growing tumors and often are observed later in the course of higher-grade lesions. Location is important in the EEG findings because the temporal lobe is one of the more epileptogenic zones. Being extra-axial, meningiomas compress the brain but cause little destruction of brain tissue. Therefore, meningiomas of the anterior or middle cranial fossa, unless large, infrequently alter EEGs. Convexity meningiomas are more likely to cause EEG changes. Focal slowing, FIRDA, or beta asymmetry may be seen. Epileptiform discharges are observed only in a minority of patients, despite their propensity to have seizures. [16, 17] Some patients may have multiple meningiomas. Slowly growing gliomas such as oligodendrogliomas and fibrillary astrocytomas (excluding tumors of deep structures) often can be distinguished from the more rapidly growing anaplastic astrocytoma and glioblastoma multiforme. With more benign tumors, which are comparatively circumscribed, the abnormalities tend to be localized and within the theta range. Indolent gliomas commonly cause seizures, and epileptiform activity may appear before significant slowing. Later, delta appears, often intermittently and at 2-3 Hz. Still later, focal PDA becomes persistent. In rapidly growing tumors, relatively more overall abnormality is present, and the background (particularly the alpha rhythm) is more impaired and disorganized. Glioblastomas produce the most widespread, slowest (often 1 Hz or less), and largest (100-200 µV) delta waves. These tumors cause prominent PDA, with marked alteration of background rhythms. Also, the high incidence of necrosis makes "flat PDA" (low-amplitude slow delta with diminished fast activity) more likely. Metastatic tumors to the brain occur commonly with carcinomas of lung, kidney, and breast and with melanomas and chorionic carcinomas. When metastases are present bilaterally, slowing often appears diffuse, although it is often asymmetric; slowing from multiple bilateral lesions is often difficult to distinguish from a toxic-metabolic disturbance. Meningeal carcinomatosis usually causes changes that correlate with the clinical situation; when deposits are widespread and cause an encephalopathy, slowing is usually diffuse. Isolated metastases usually cause less prominent abnormalities than gliomas of similar size and location. Slow waves show higher frequency, lower amplitude, and less persistence than with high-grade gliomas, and normal background rhythms are more likely to be preserved. Cancer's remote effects are well known but are often hard to diagnose. Limbic encephalitis, often with Hu antibody and anti-NMDA receptor encephalitis syndrome, can have seizures as clinical symptoms, with the latter even presenting with status epilepticus. The advent of paraneoplastic antibodies (Hu, NMDA) allows these diagnosis to be made; however, the treatment is essentially the treatment of the tumor. The NMDA receptor antibody syndrome, which is now probably the best characterized paraneoplastic syndrome, requires tumor removal (ovarian teratoma in female) and is more treatable with immunosuppressive agents, such as high dose steriods, IVIG, plasmapheresis and other immunomodulating agents. An unfortunate late side effect of radiation therapy of brain tumors is radiation necrosis. Radiation necrosis can look like a growing mass and may be hard to distinguish from tumor growth or recurrence on neuroimaging on CT scanning or MRI and may require a PET scan to determine if it has a hypometabolic or hypermetabolic pattern. Because radiation necrosis is not growing cells, an inflammatory process affects normal tissue at the tumor interface, which can produce slowing and inflammatory eye disease. Because of improvements in neuroimaging and neurosurgery and recognition of the benefits of early resection, serial EEG studies now are rarely performed prior to surgery. Older studies suggest that EEG evolution during tumor growth is characterized mainly by increased slowing—lower frequency, higher amplitude, more persistence, and wider distribution—with rate of change depending mainly on rate of tumor growth. In addition, epileptiform discharges are more likely to occur as the tumor grows. Occasionally, successful treatment with steroids or chemotherapy can cause reduction in slowing and epileptiform activity. Following resection, dramatic changes may occur in the EEG; these usually stabilize over periods of weeks to months. Since screening for tumor recurrence now depends on neuroimaging, serial EEGs usually are reserved for patients with clinical changes that are not explained by imaging, particularly when seizures are suspected. In the immediate postoperative period, the EEG frequently deteriorates, with prominent focal and sometimes generalized slowing. Localized PDA can occur if, for example, the temporal or frontal lobe was retracted to provide access to a deep tumor. After a week or so, EEG abnormalities improve, and slow waves diminish, although much individual variation exists. In most patients, the residual EEG abnormality becomes stable 3-4 months after craniotomy. Abnormalities seldom resolve completely; residual abnormality depends largely on completeness of tumor excision. Subsequent localized or generalized increase in slowing or loss of background activity strongly suggests tumor recurrence. With further progression, delta activity increases in voltage while frequency becomes slower and distribution wider. Emergence of epileptiform activity without changes in focal or generalized slowing may occur and does not necessarily imply tumor recurrence. Replacement of the skull defect with a bone or prosthetic flap often does not significantly affect these waveforms. Evaluation of postoperative epileptiform activity, therefore, is challenging because breach activity may mimic epileptiform discharges, and their distributions are expected to overlap. 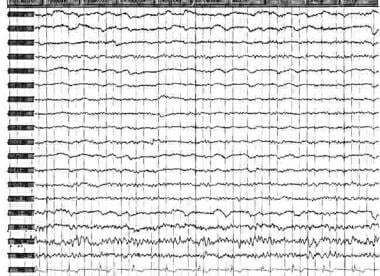 In a majority of patients, it may be impossible to confidently determine the existence of epileptiform activity. The existence of a breach rhythm does not indicate an increased propensity for seizures. Appearance of a postoperative breach rhythm is almost universal. Preoperative and postoperative recordings on a patient with an oligodendroglioma illustrate these changes (see the images below). At times, such rhythmic activity can suggest a seizure pattern, but it does not have the characteristic evolution of frequency, amplitude, and distribution of an ictal discharge. Because of these factors, a magnetoencephalogram, which is not as significantly affected by skull defects, may be preferable to the EEG in these patients. A perioperative stroke with sizable territory infarct typically exhibits increased slowing in the region of the stroke, with loss of fast activity if cortex is involved. Hemorrhagic stroke or hemorrhage into the tumor bed also is accompanied by increased slowing, which may be bilateral if deep structures are affected. The clinician and electroencephalographer also must remember that patients with brain tumors can develop additional diseases, particularly when immunosuppressed, such as progressive multifocal leukoencephalopathy or herpes simplex encephalitis. In these patients, EEG changes such as focal slowing or periodic discharges reflect the new condition. A generalized tonic-clonic seizure frequently heralds the commencement of rapid cognitive deterioration in malignant gliomas. The resulting change in mental status may be due to the progression of disease coupled with radiotherapy/chemotherapy or to either frequent or ongoing seizures with postictal encephalopathy. Whether to escalate therapy with additional antiepileptic medication presents difficulty in management. Both conditions may result in slowing on routine EEGs. Although PLEDs and focal interictal epileptiform discharges may frequently be seen, they may not necessarily imply clinically significant changes in cognition if they were long-standing. Baseline EEGs obtained previously may be helpful for comparison and may help to guide treatment decisions. Continuous EEG monitoring can identify subtle seizures and allow correlation of background organization and slowing to clinical improvement or deterioration. The character and distribution of EEG changes produced by tumors depend primarily on lesion size, rate of growth, distance from the cortical surface, and specific structures involved. PDA is the hallmark of tumor localization. Both metastatic tumors and gliomas commonly cause delta activity, often localized to the tumor site and neighboring zone, although bilateral slowing may occur. Changes are more marked with aggressive gliomas. Deep tumors are more likely to cause widespread hemispheric or bilateral slowing, often rhythmic (IRDA). Small deep tumors may cause no abnormalities, especially if the thalamus is not involved. When the tumor is growing rapidly and involves cortex, localized loss of background activity may occur. Spikes, sharp waves, or spike-wave discharges often are observed at the time of diagnosis in slowly growing tumors. With more malignant neoplasms, both seizures and epileptiform discharges occur later. Location of discharges does not always correlate with tumor location. Craniotomies and other interventions alter the EEG in usually predictable ways. Breach rhythm can complicate the interpretation of interictal epileptiform activity. Despite advances in neuroimaging, EEG still offers a unique view of physiologic changes over time in patients with brain tumors, especially in regard to seizures. Walter G. The location of cerebral tumors by electroencephalography. Lancet. 1936. 8:305-8. Yang PF, Shang MC, Lin Q, Xiao H, Mei Z, Jia YZ, et al. Three-dimensional intracranial EEG monitoring in presurgical assessment of MRI-negative frontal lobe epilepsy. Medicine (Baltimore). 2016 Dec. 95 (50):e5192. [Medline]. [Full Text]. Louis DN, Ohgaki H, Wiestler OD, Cavenee WK, Burger PC, Jouvet A, et al. The 2007 WHO classification of tumours of the central nervous system. Acta Neuropathol. 2007 Aug. 114(2):97-109. [Medline]. Glantz MJ, Cole BF, Forsyth PA, Recht LD, Wen PY, Chamberlain MC, et al. Practice parameter: anticonvulsant prophylaxis in patients with newly diagnosed brain tumors. Report of the Quality Standards Subcommittee of the American Academy of Neurology. Neurology. 2000 May 23. 54(10):1886-93. [Medline]. Forsyth PA, Weaver S, Fulton D, Brasher PM, Sutherland G, Stewart D, et al. Prophylactic anticonvulsants in patients with brain tumour. Can J Neurol Sci. 2003 May. 30(2):106-12. [Medline]. Glantz MJ, Cole BF, Friedberg MH, Lathi E, Choy H, Furie K, et al. A randomized, blinded, placebo-controlled trial of divalproex sodium prophylaxis in adults with newly diagnosed brain tumors. Neurology. 1996 Apr. 46(4):985-91. [Medline]. Franceschetti S, Binelli S, Casazza M, Lodrini S, Panzica F, Pluchino F, et al. Influence of surgery and antiepileptic drugs on seizures symptomatic of cerebral tumours. Acta Neurochir (Wien). 1990. 103(1-2):47-51. [Medline]. Beaumont A, Whittle IR. The pathogenesis of tumour associated epilepsy. Acta Neurochir (Wien). 2000. 142(1):1-15. [Medline]. Mittal S, Barkmeier D, Hua J, Pai DS, Fuerst D, Basha M, et al. Intracranial EEG analysis in tumor-related epilepsy: Evidence of distant epileptic abnormalities. Clin Neurophysiol. 2016 Jan. 127 (1):238-244. [Medline]. [Full Text]. Zaatreh MM, Firlik KS, Spencer DD, Spencer SS. Temporal lobe tumoral epilepsy: characteristics and predictors of surgical outcome. Neurology. 2003 Sep 9. 61(5):636-41. [Medline]. Whittle IR, Beaumont A. Seizures in patients with supratentorial oligodendroglial tumours. Clinicopathological features and management considerations. Acta Neurochir (Wien). 1995. 135(1-2):19-24. [Medline]. Hwang SL, Lin CL, Lee KS, Lieu AS, Kuo TH, Chang CZ, et al. Factors influencing seizures in adult patients with supratentorial astrocytic tumors. Acta Neurochir (Wien). 2004 Jun. 146(6):589-94: discussion 594. [Medline]. Lowry JK, Snyder JJ, Lowry PW. Brain tumors in the elderly: recent trends in a Minnesota cohort study. Arch Neurol. 1998 Jul. 55(7):922-8. [Medline]. Fischer-Williams M, Dike GL. Brain tumors and other space-occupying lesions. Niedermeyer E, DaSilva FL, eds. Electroencephalography: Basic Principles, Clinical Applications, and Related Fields. 3rd ed. Williams & Wilkins; 1993. 305-432.
van Dellen E, Hillebrand A, Douw L, Heimans JJ, Reijneveld JC, Stam CJ. Local polymorphic delta activity in cortical lesions causes global decreases in functional connectivity. Neuroimage. 2013 Jun 12. [Medline]. Rothoerl RD, Bernreuther D, Woertgen C, Brawanski A. The value of routine electroencephalographic recordings in predicting postoperative seizures associated with meningioma surgery. Neurosurg Rev. 2003 May. 26(2):108-12. [Medline]. Wirsching HG, Morel C, Gmür C, Neidert MC, Baumann CR, Valavanis A, et al. Predicting outcome of epilepsy after meningioma resection. Neuro Oncol. 2016 Jul. 18 (7):1002-10. [Medline]. [Full Text]. Ferrier CH, Aronica E, Leijten FS, Spliet WG, van Huffelen AC, van Rijen PC. Electrocorticographic discharge patterns in glioneuronal tumors and focal cortical dysplasia. Epilepsia. 2006 Sep. 47(9):1477-86. [Medline]. Zhang Y, Liu G, Jiang MD, Li LP, Su YY. Analysis of electroencephalogram characteristics of anti-NMDA receptor encephalitis patients in China. Clin Neurophysiol. 2017 Jul. 128 (7):1227-1233. [Medline]. [Full Text]. Kampf C, Grossmann A, Benecke R, Rösche J. Disappearance of breach rhythm heralding recurrent tumor progression in a patient with astrocytoma. Clin EEG Neurosci. 2013 Jul. 44(3):237-43. [Medline]. Cobb WA, Guiloff RJ, Cast J. Breach rhythm: the EEG related to skull defects. Electroencephalogr Clin Neurophysiol. 1979 Sep. 47(3):251-71. [Medline]. Siddiqui F, Bromfield E, Winslow N. Role of EEG in predicting post-operative seizures in brain tumor patients. Epilepsia. 2000. 41(Suppl 7):206. Korinthenberg R, Scheuring B, Boos J, Niemeyer C. On the origin of EEG-slowing and encephalopathy during induction treatment of acute lymphoblastic leukemia. Med Pediatr Oncol. 2002 Dec. 39(6):566-72. [Medline]. Bagchi BK, Kooi KA, Selving BT, Calhoun HD. Subtentorial tumors and other lesions: An EEG study of 121 cases. Electroencephalogr Clin Neurophysiol. 1961. 13:180-92. Bazil CW, Herman ST, Pedley TA. Focal electroencephalographic abnormaliites. Ebersole JS, Pedley TA, eds. Current Practice of Clinical Encephalography. 3rd ed. Philadelphia: Lippincott Williams & Wilkins; 2003. 303-47. Bickford RG. Electroencephalographic diagnosis of brain tumors. Am J Surg. 1957 Jun. 93(6):946-51. [Medline]. Binnie CD, Prior PF. Electroencephalography. J Neurol Neurosurg Psychiatry. 1994 Nov. 57(11):1308-19. [Medline]. Blume WT, Girvin JP, Kaufmann JC. Childhood brain tumors presenting as chronic uncontrolled focal seizure disorders. Ann Neurol. 1982 Dec. 12(6):538-41. [Medline]. Boddie HG, Banna M, Bradley WG. "Benign" intracranial hypertension. A survey of the clinical and radiological features, and long-term prognosis. Brain. 1974 Jun. 97(2):313-26. [Medline]. Chatrian GE, Shaw CM, Leffman H. The significance of periodic lateralized epileptiform discharges in EEG: An electrographic, clinical, and pathological study. Electroencephalogr Clin Neurophysiol. 1964 Aug. 17:177-93. [Medline]. Daly D, et al. Rhythms associated with gliomas of the cerebral hemispheres. Electroencephalogr Clin Neurophysiol. 1950. 2:360P. Daly D, Whelan JL, Bickford RG, Maccarty CS. The electroencephalogram in cases of tumors of the posterior fossa and third ventricle. Electroencephalogr Clin Neurophysiol Suppl. 1953 May. 5(2):203-16. [Medline]. Daly DD. Brain tumors and other space occupying processes. Remond A, ed. Handbook of EEG and Clinical Neurophysiology. Amsterdam: Elsevier; 1975. Vol 14: 5-10. Daly DD, Pedley TA, eds. Current Practice of Clinical EEG. 2nd ed. Philadelphia, Pa: Lippincott-Raven; 1997. Daly DD, Thomas JE. Sequential alterations in the electroencephalograms of patients with brain tumors. Electroencephalogr Clin Neurophysiol Suppl. 1958 Aug. 10(3):395-404. [Medline]. Fariello RG, Orrison W, Blanco G, et al. Neuroradiological correlates of frontally predominant intermittent rhythmic delta activity (FIRDA). Electroencephalogr Clin Neurophysiol. 1982 Aug. 54(2):194-202. [Medline]. Fisch BJ, Pedley TA. Evaluation of focal cerebral lesions. Role of electroencephalography in the era of computed tomography. Neurol Clin. 1985 Aug. 3(3):649-62. [Medline]. Fischer-Williams M. Brain tumors and other space-occupying lesions. Neidermyer E, Lopes da Silva F, eds. Electroencephalography: Basic Principles, Clinical Applications, and Related Fields. 2nd ed. Baltimore, Md: Urban & Schwarzenberg; 1987. 229-59. Hess R. EEG and cerebral tumors. Significance of EEG signs for location of cerebral tumors. Electroencephalogr Clin Neurophysiol. 1961. 19, 75-110. Hughes JR, Zak SM. EEG and clinical changes in patients with chronic seizures associated with slowly growing brain tumors. Arch Neurol. 1987 May. 44(5):540-3. [Medline]. Khan RB, Onar A. Seizure recurrence and risk factors after antiepilepsy drug withdrawal in children with brain tumors. Epilepsia. 2006 Feb. 47(2):375-9. [Medline]. Krenkel W. The EEG in tumors of the brain. Vinken PJ, Bruyn GW, eds. Handbook of Clinical Neurology. Amsterdam; 1974. Vol 16: 418-54. Labate A, Briellmann RS, Harvey AS, et al. Temporal lobe dysembryoplastic neuroepithelial tumour: significance of discordant interictal spikes. Epileptic Disord. 2004 Jun. 6(2):107-14. [Medline]. Leal AJ, Moreira A, Robalo C, Ribeiro C. Different electroclinical manifestations of the epilepsy associated with hamartomas connecting to the middle or posterior hypothalamus. Epilepsia. 2003 Sep. 44(9):1191-5. [Medline]. Merritt HH. Tumors. A Textbook of Neurology. Philadelphia, Pa: Lea & Febiger; 1991. 213-319. Raymond AA, Fish DR, Sisodiya SM, et al. Abnormalities of gyration, heterotopias, tuberous sclerosis, focal cortical dysplasia, microdysgenesis, dysembryoplastic neuroepithelial tumour and dysgenesis of the archicortex in epilepsy. Clinical, EEG and neuroimaging features in 100 adult patient. Brain. 1995 Jun. 118 ( Pt 3):629-60. [Medline]. Reinikainen KJ, Keranen T, Lehtinen JM, et al. CT brain scan and EEG in the diagnosis of adult onset seizures. Epilepsy Res. 1987 May. 1(3):178-84. [Medline]. Rowan AJ, Rudolf Nd, Scott DF. EEG prediction of brain metastases. A controlled study with neuropathological confirmation. J Neurol Neurosurg Psychiatry. 1974 Aug. 37(8):888-93. [Medline]. Schiff D. Classification, epidemiology, and etiology of brain tumors. Samuels MA, Feske S, eds. Office Practice of Neurology. 2nd ed. Philadelphia, Pa: Churchill Livingstone; 2003. 1006-13. Van der Drift JHA, Magnus O. EEG and cerebral tumor. Primary thalamic lesions. Electroencephalogr Clin Neurophysiol. 1961. 19:125-37. Wen PY. Clinical presentation and diagnosis of brain tumors. Samuels MA, Feske S, eds. Office Practice of Neurology. New York: Churchill Livingstone; 1996. 813-7.